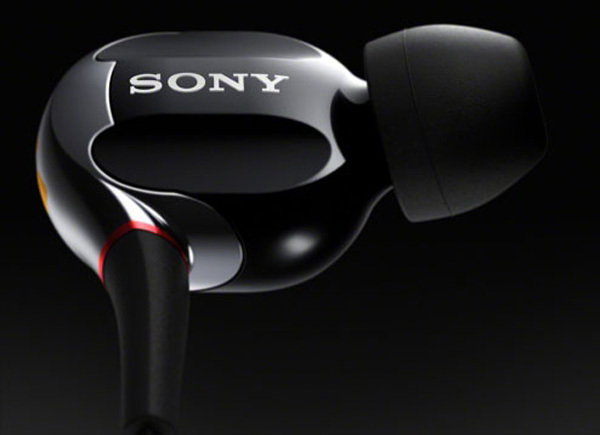 Sony’s XBA-4 Earphones are BAD but that means very, very GOOD. Confused? You won’t be. 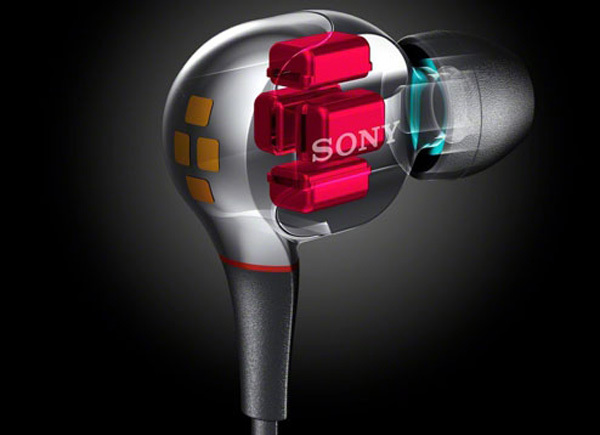 SONY HAS TAKEN an interesting approach with its new XBA range of in-ear ‘phones – every model, from the entry point to the flagship, is fitted with balanced armature drivers instead of the conventional dynamic (speaker cone) drivers as found on the vast majority of earphones and headphones. A balanced armature driver (BAD) looks nothing like a cone driver. BADs are tiny rectangular boxed speaker units that still employ voice coils and magnets but instead of moving a cone back and forth, an arm drives a diaphragm or foil, which shifts the air as required to generate sound pressure. There isn’t really a “better” choice between BADs and dynamic drivers; rather, each has its advantages. BAD units are far smaller and lighter than cone-based units, which offers designers more flexibility in driver placement and ‘phone layout. BADs also offer higher levels of sensitivity and are theoretically capable of higher detail resolution. Their compact size means that multiple units can be combined in a single housing to tune the sound characteristics. On the other hand, dynamic drivers are simpler, offer a wider frequency range and usually have stronger and deeper bass levels. The drivers in Sony’s XBA ‘phones are made in Japan specifically for music applications using a new design that eliminates the air ducts that are common to most BADs. 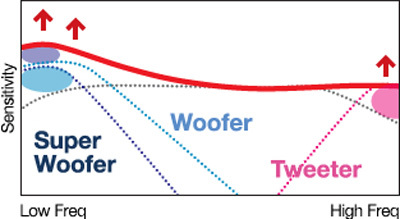 There are four BADs in the XBA ‘phones, making for a full range unit: a tweeter, a woofer and a super woofer. The $399 XBA-4 being reviewed isn’t exactly inexpensive as far as in-ear ‘phones go, but there’s a fair amount of value and technology packed into those housings. In addition to containing the four high-tech BADs listed above, the housings themselves are double layered to reduce vibrations, with the inner housing being made of ABS plastic and the outer one constructed of magnesium. The four BADs are tuned to complement each other, filling in the bottom and top parts of the frequency range that the full range driver simply can’t generate. The housings are reasonably compact with no irritating bits to poke or prod the ear, and the XBA-4’s proved to be exceptionally comfortable ‘phones to wear for extended periods of time. They ship with four sets of soft rubber ear tips plus three noise cancelling versions, which are the same as the standard rubber ones except for a layer of foam to help cut out external noise. The ‘phones do a decent job at isolating noise with the standard tips and are slightly more silent with the noise cancelling tips, but not as isolating as ‘phones with deep insertion foam tips from the likes of Shure or Ultimate Ears. The cable is narrow and flat with a tendency to get tangled, but it is quite long, reaching easily down to an iPhone stashed in my cargo pants pocket. A cable arranger is included, which allows users to wrap the cable to shorten it as needed. These asymmetric ‘phones are designed to be worn with the right hand cable run behind the neck, which is the way you’ll have to do it if you don’t want some of the cable hanging low across your chest. I moaned about the lack of an inline mic/volume control in my review of the Paradigm Shift E3m ‘phones, but I don’t mind its absence here as much because I’d use that functionality more in an active context – I’m not likely to use a set of $399 ‘phones at the gym. The 3.5mm minijack connector is a sturdy metal type at a ninety-degree angle that should resist damage. It’s worth pointing out that Ultimate Ears’ Super-Fi 5 Pro ‘phones have been my portable ‘phones of choice for years. They went around the world with me last year and they weren’t treated at all well, but their replaceable cable means that they’re still going strong – in fact they’re on their third cable. The only thing that could kill them would be a catastrophic impact to the capsules. The Sony’s cable is fixed, and sooner or later that’s going to put them out of service, but then again, most earphones have fixed cables and finite lifespans, so it’s not really something to hold against them. The only thing I was initially aware of when listening to the XBA-4’s was their crisp treble. It occurred to me that I was hyper-aware of the top end because I’d spent a lot of time recently with ‘phones that have rolled off or subdued treble. Some pundits have indicated that the Sony’s have a metallic, grainy or even a sibilant treble, but I didn’t find this to be the case at all. They’re not bright or edgy or even unduly emphasised at the top, but there is plenty of treble energy on hand when needed, along with the ability to forensically render minute details. If the recording has an edge to it or is badly recorded with a spitting treble you’ll know all about it, but if you want to hear crashing cymbals instead of a faded “tchsssss” noise, then you’ll be in your element. This ability to resolve detail carries through the rest of the frequency range all the way to the lowest notes. The best way to imagine the sound of the XBA-4’s is to draw a straight line through the frequency spectrum from deep low to extreme high and then populate it with many thousands of subtle points; these ‘phones sound as neutral and uncoloured as any in-ear units I’ve ever heard, and they do detail like nothing else at the price. The XBA-4’s are excellent at clarifying those tiny background nuances or highlighting those double-miked vocals that you struggle to distinguish through your speakers (or to hear at all, for that matter). Detail is always good, but neutrality isn’t always an entirely desirable thing – if a flat response and perfect measurements were the be all and end all of hi-fi, then we’d all be listening to gear tuned to the numbers instead of the sound, and that would be pretty damn boring. That’s not to say that the XBA-4’s are boring but if you like to literally feel the bass, experience an enhanced sense of slam or have your lousy recordings toned down at the top, then these aren’t the ‘phones for you. If, on the other hand, you want to hear a remarkably accurate rendition of your music (for better or worse) without spending a fortune, then they are the answer. High quality recordings are where the XBA-4’s are at their best, which is when you’ll really start to hear your music. Take for example Aimee Mann’s ‘High on Sunday 51’ from Lost In Space. The XBA-4’s open up the vocal track, making the double-miked male/female chorus obvious instead of veiled while keeping the various instruments clearly separated, easy to follow yet part of a unified whole. Beck’s ‘The Golden Age’ from Sea Change is a distinct joy through the Sony’s as every element of the track is laid bare for close inspection. There’s a degree of tape hiss, then the strummed guitar intro comes in with the notes echoing off into space before the rest of the instruments appear. The backing vocals are as clear as if they’re being delivered by their own dedicated driver, and you get to listen deeply into the way Beck is forming each word, especially the long, drawn out ones where there’s a sense that he’s less than comfortable. You simply don’t get that much information from most in-ear ‘phones. The detail levels mean that there’s a feeling of air and spaciousness to the sound because the XBA-4’s do such a good job of opening up the acoustic space, including instrument resonance and fade, the spatial echoes and decay and the artefacts of the recording process. The sound is entirely cohesive and you’re never aware that you’re listening to multiple drivers. Effectively, as mentioned earlier, you’re mostly hearing the full range BAD with the other three BADs filling in at the top and bottom. Like the Skullcandy Mix Masters reviewed here, the XBA-4’s do need some volume behind them as they come alive with a bit of grunt. At low levels, they sound somewhat flat. As an example of how things can be done differently, my Ultimate Ears Super-Fi 5 Pro dual armature ‘phones are slightly less open on top, not as detailed through the mids and bass but have more upper bass weight and extra slam and impact, despite not having a super woofer to fill out the lowest octaves. Swapping between the two ‘phones on tracks such as ‘Feel Me (Intro)’ from Big Boi’s Sir Lucious Left Foot: The Son of Chico Dusty reveals a lot, but it’s hard to pick between the two presentations. The Super-Fi 5’s punch harder through the bass, thanks to a low-mid peak even though the XBA-4’s actually reach deeper into the lowest octaves. The bass notes are more textured and articulate through the Sony’s, and the whistled notes and the keyboards in the first ten seconds or so are more detailed. The Super-Fi 5s make the track a more enjoyable overall listen by adding some warmth and vigour to the sound and by taming the aggressive top end, but the XBA-4’s tell you more about the recording, albeit in an analytical fashion. I can appreciate both versions of the track and had no trouble using the Sony’s for any genre of music over long periods of time. Sony’s highly refined XBA-4 ‘phones reflect the sheer depth of engineering skills that Sony has in house. Sonically, they’re quite special and are designed to accurately reproduce recordings, not to gloss over bad ones or to add something to the music that simply isn’t there. That’s going to suit some tastes (and musical genres) very well, but others may find them to be less exciting than many similarly priced ‘phones, which brings us to the eternal hi-fi question: do we want to hear the recording or do we want to enjoy what we’re listening to? They’re not always the same thing. Hi – you have ranked the XBA-4s as 5 stars and the MDR-1s as 4. A Sony Rep told me the MDR-1s have superior sound. Which sound better to you ? I know the over-the-ear phones have a wider range – but perhaps these are frequencies that humans can’t hear anyway or are at levels that weren’t included on CD mixes…. Do the MDR-1s leak sound to other people ? Do the MDR-1s present a greater sound stage – sound bigger and more dramatic ? My current buds are Sony EX-500s and I hope that a move to the MDR-1s or the XBA-4s would be a significant upgrade.